In his wind-up for Thursday’s speech, Obama has made unemployment his theme. “Let’s put America back to work,” Obama said to union leaders. Ever the careful politician, Obama has not released details of what he will say, though it is hard to see how he can propose much given the budgetary concessions he has already made. It is tempting to prepare in advance a critique of the inevitable half-measures and technocratic manipulations that have been part-and-parcel of mainstream Democratic strategy for decades now. However, there is a deeper problem. The problem is not with the inevitable inadequacy of what Obama will propose, but with how Obama wants to define the problem that needs to be addressed. The problem, as Obama wants to define it, is unemployment – ‘put America back to work.’ And of course, unemployment is a big problem. More specifically, persistently high levels of unemployment next to anemic job growth. 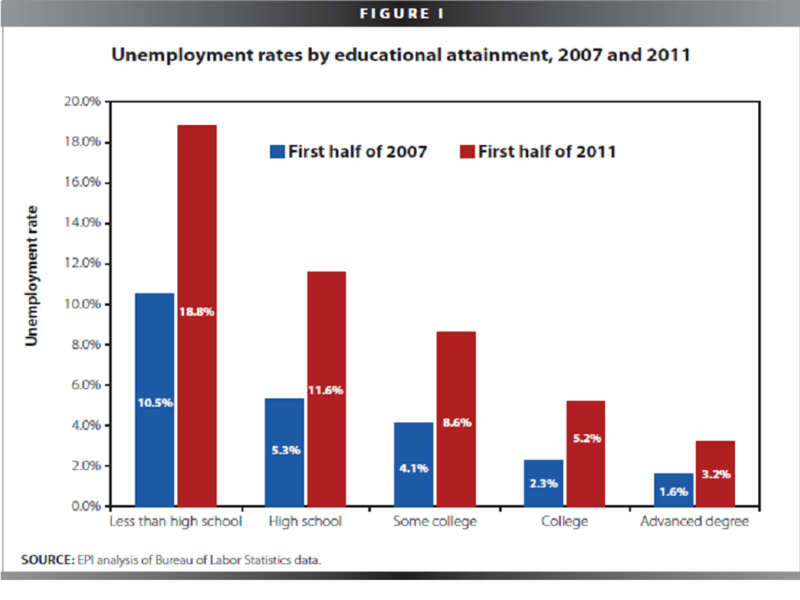 (See Konczal at Rortybomb for a discussion of the recent unemployment numbers.) But so too is underemployment, crappy jobs, stagnating wages, and declining compensation figures. That is to say, what needs to be rejected is the attempt to present unemployment in isolation, as a distinct problem that can and should be addressed independent of these other economic problems. The exclusive emphasis on unemployment lets the financial crisis, and the background growth model that produced it, off the hook. Indeed, it is a way of trying to address unemployment while leaving the background structure of society relatively untouched. 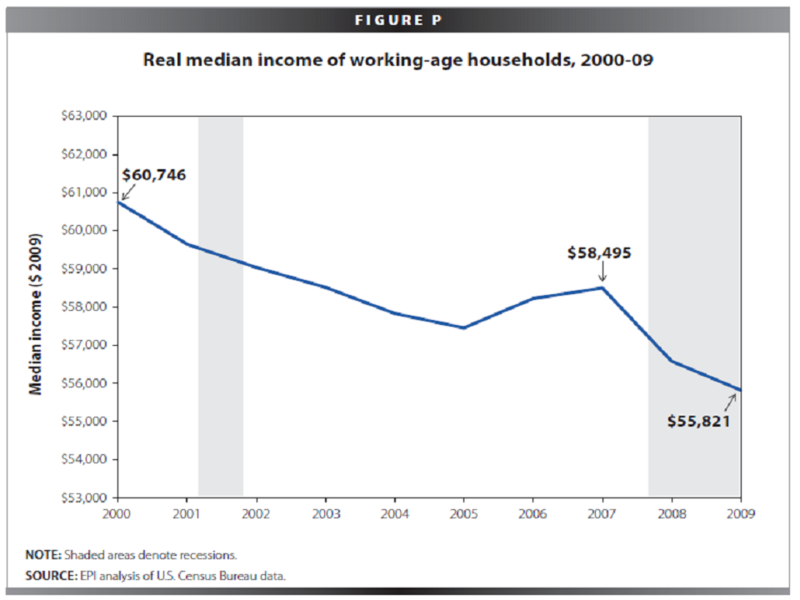 Obama’s strategy also misrepresents the groups of people that have an interest in a new way of organizing the economy. It is therefore not just analytically but politically problematic, as it carves up the unemployed, the underemployed, the working poor, and everyone else struggling to get by, into different interest groups. This might make problems appear manageable, but it undermines the formation of effective and powerful political coalitions that might actually be able to change things. The jobs problem is deep and structural. It springs from the structure of ownership, the post-bubble indebtedness, the flight to T-bills instead of productive investment. A real jobs program would have to address these issues, not just send some surplus construction works out to fix schools and highways. But connecting the current jobs problem with the financial crisis, financialization, and the structure of ownership is unimaginable to current leadership. Wage growth has been slower in the past two years than the previous thirty, and, as we have pointed out before, the previous thirty years have been pretty stagnant. If one adds in other forms of compensation, things have not been dramatically better. According to EPI, since the crahs 38% of families have been directly affected by wage, benefit, or hours reduction and 24% by loss of health insurance. 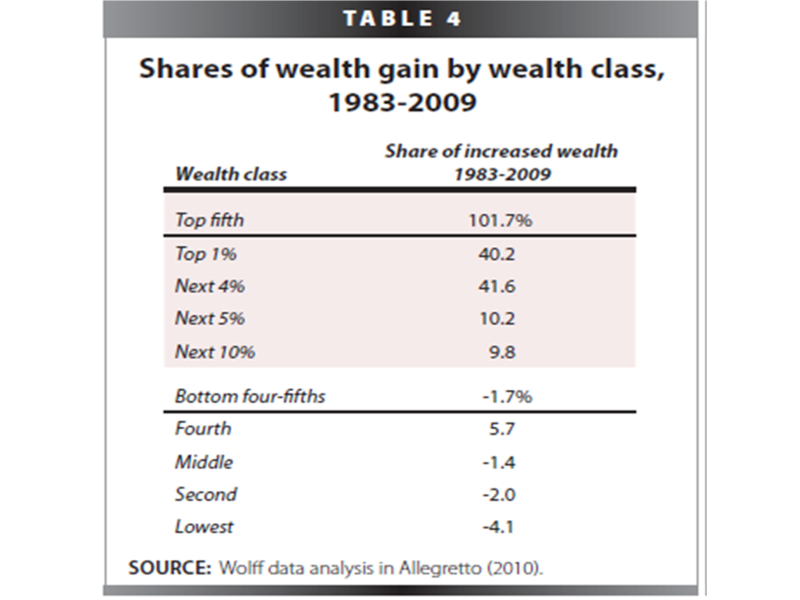 A -1.7% decline in wealth for the bottom 80% of all Americans. Clearly, the problem in the United States with the economic development of the past decades, and with the post-crisis ‘recovery,’ is not just persistently high levels of unemployment. It is with the broader structure of the jobs created, their associated levels of income, overall compensation, and wealth. The jobs problem is one amongst a series of problematic features with the way jobs are and are not created. But these are not even issues Obama has wanted to mention, let alone address, in any consistent way. Focusing on what has happened to the employed, not just the unemployed, matters not just in ‘policy’ but also ‘political’ terms. As a matter of policy, it suggests that more expansive thinking is needed than just a works program that might mop up some of the worst excess of recent events. But as a matter of politics it matters because presents a decidedly different way of thinking about the interests at stake than Obama’s focus on the unemployed. At the moment, Obama seems to be reproducing the political failure of the health care debate – where he focused on the 20% uninsured rather than the majority of the population who could benefit from a different system altogether. The more Obama appealed to the worst off, the more the rest believed – not so illegitimately – that their interests were not seriously under consideration. One just cannot build adequately strong political support for significant economic policies that way. In one sense folding a jobs program into a broader argument for improving the conditions of the already working classes might seem more of stretch, because it is more radical as an appeal. On the other hand, it appeals to shared interests of a majority of citizens – indeed, by some measures, to roughly 80% who have seen stagnating incomes and declining wealth. In that sense, it is just as viable a political strategy. Policy and politics, interest and action, go together. One kind of politics – the appeal to the interests of unemployed and employed alike – implies a different set of policies. It is a more transformative approach. Another kind of politics, the one Obama prefers, is the strategy of division, isolation and containment. Deal with the unemployed separately from the underemployed, the uninsured separately from the underinsured, the poor separate from the middle, and so on and so forth. This suits a technocratic mindset – one lacking both a program and political imagination. It should be resisted all the more for that. The problem, in other words, is not just the ways Obama’s jobs program won’t work, but also with the ways it very well might work. It might work to even more deeply divide an already fragmented and confused body of citizens – a body whose shared interests are usually sacrificed at the altar of moderation and technocracy.